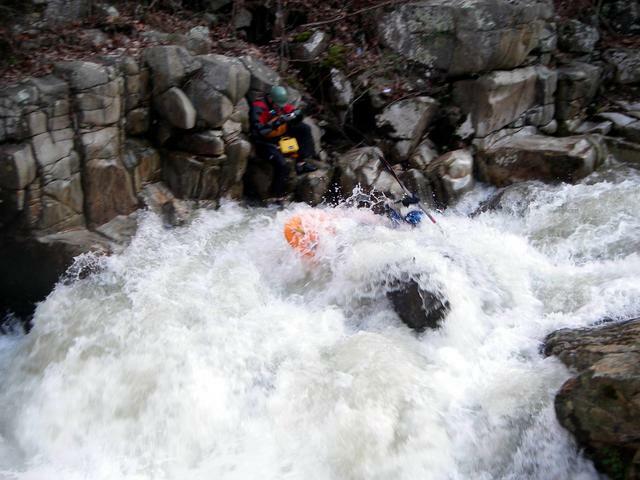 After a cold night at the Campground (Breaks Interstate Park) and breakfast at the park lodge, I was down to the “Garden Hole” takeout to meet Jason B. and others from SW Va. for another run at the Upper Russell Fork except today I was doing a demo boat run. Once all arrived our group of 9 paddlers included, Jason B. k-1, Chuck R. k-1, Gene C. k-1, John A. k-1, Terri A. k-1, Brandon D. k-1, Micheal B. k-1, Dan P. oc-1, and myself-Paddlin-ed in k-1. After making quick work of our shuttle and dressing out, we where off on the river putting in at the Flannigan Dam Release pool on the Pound River. 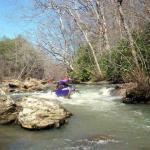 October for paddlers in the SE is Russell Fork release season. For four weeks each October the Flannigan Reservoir on the Pound river releases to drop to winter levels for flood control. 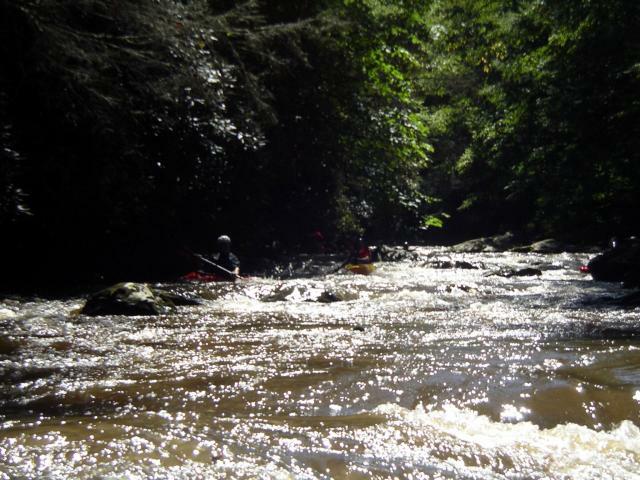 Put in for the upper Russell Fork is at the release pool on the Pound which after a mile or two flows into the actual Russell Fork river at Bartlet Va. and combines with the natural flow to provide around 700+cfs of flow for three weekends, and then 1000+cfs for the fourth weekend. 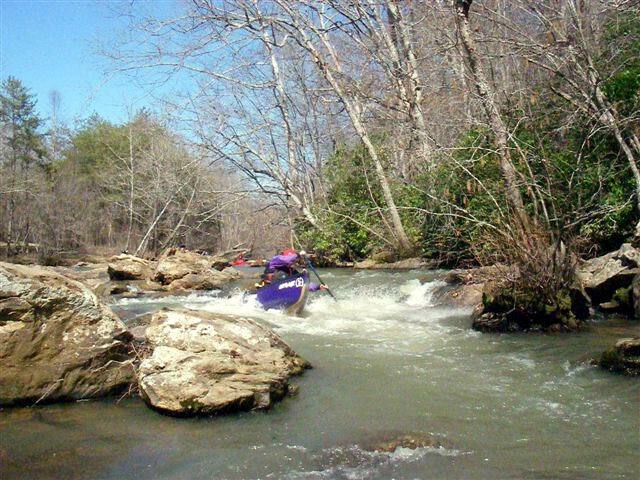 Paddlers can choose the upper, which begins on the Pound below the dam to the confluence with the Russell Fork proper and then down to the upper takeout at “The Garden Hole”. Saturday 9/28/08 arrived with rains over the last day and a half or so, spun off from remnants of hurricanes. By early morning the Wilson gauge was on the move up, and the rain gauges indicated more was about to come down the watershed. 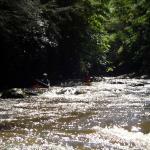 Eddie C. k-1, Gary M. k-1, Darron P. k-1 and myself, Paddlin-ed in k-1 all showed up to run this wonderful creek run and we where not disappointed, but delighted with a initial level between +1 and 0″. At this level there plenty of flow. The day was a bit cloudy with occasional showers and temps in the high 60’s to low 70’s. Water was clear and clean and cool but not cold. 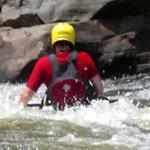 After a warm up of the Lower Gauley on Friday, I was looking forward to getting a run in on the Upper Gauley, and was joined by Darron P. k-1, Gif. G. c-1, Joey k-1, Justin in k-1 and a buddie of his in k-1, plus Stuart S. k-1. Stuart was nice enough to lead our group. While several of us had done the river a couple of times previously, we where glad to have Stuart along who knew the river well. 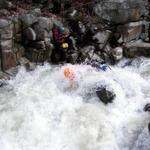 On this run there are places in certain rapids you do not want to be and having someone along with enough runs to know where these places are is a healthy thing.